Your child will have swashbuckling good fun with the Make Me a Pirate Set from the Small World Toys Ryan's Room collection. Designed for safety as well as fun, the 4-piece set is great for the dress-up box, the school play, and of course for Halloween. 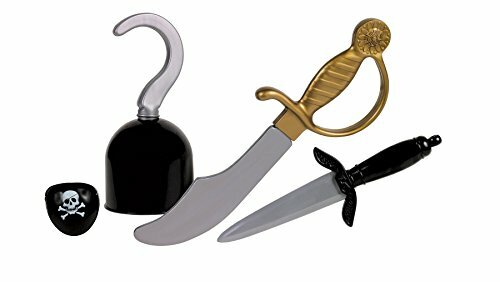 The Make Me A Pirate set includes a cutlass, hook, dagger and eye patch. All the edges are blunt and will not cut. The cutlass measures 13'' long. Designed for children 3 years and older. The Small World Ryan's Room collection inspires discovery and imagination, fostering valuable developmental skills kids will use for a lifetime. We call it play with a purpose - kids just call it fun. Small World Toys has been a leading toy manufacturer for 50 years. We believe that play is an integral and necessary part of a child's development and education. At Small World Toys, we are committed to developing fun, innovative, high quality products for children of all ages. Small World Toys has been a leading toy manufacturer for 50 years. We believe that play is an integral and necessary part of a child's development and education. At Small World Toys, we are committed to developing fun, innovative, high quality products for children of all ages. If you have any questions about this product by Small World Toys, contact us by completing and submitting the form below. If you are looking for a specif part number, please include it with your message.